and learn how to keep that free money in your pocket. Everyone knows that the major bookies offer incentives to open an account and further incentives for you to keep using it. Keeping hold of that money is more of a problem as it is all too easy to lose it on your qualifying bets. The first task is to identify Bookmakers offering free moneyor Casinos giving away free poker chips and there are a large number of sites that do this such as the free bets directory at Racing Post. Ladbrokes know that people will be having a bet on the Grand National so it is not in their interest to offer free money on this event. They prefer internet customers as the costs are low. You have to spend some money to gain the free bet and you have to use the free bet quickly to encourage you to use your account again without delay. So, now we have decided on a suitable offer and become familiar with the rules, how should we use it? 1. Place a bet you were intending to place which hopefully will be a winner and then use the the free bet for a chance to win more dosh. 2. The clever way is to obtain a guaranteed return to hedge the bet and keep hold of as much of the investment as possible and for this you will need an account at Betfair or one of the betting exchanges. 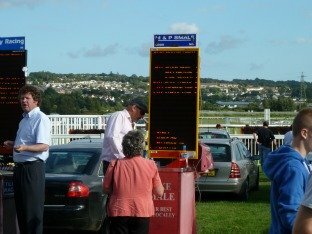 The next task is to find an event for which Ladbrokes are offering similar prices to the lay price on Betfair. There will be a slight difference but it should not be difficult to find one close enough to work. Enter the Ladbrokes price in the 'Back' window with a stake of £25. Next enter the Betfair lay price in the 'Lay' window then click 'Recalculate'. It will be seen that the lay liability is £52.38 (you will need to ensure you have funds available to cover this liability in your Betfair account)while the back return is £50. Whatever the outcome of the event the result is a loss of £2.38. Ladbrokes will now credit your account with £25 so you have actually achieved a profit of £22.62. Press 'calculate my risk free bet'. The calculations show that you need to place a lay bet at 3.2 of £15.87 resulting in a liability at Betfair of £34.92. Voila! you're guaranteed a profit of £15.08. If you now deduct the qualifying bet loss of £2.38 you end up with a free money profit of £12.70. Once familiar with the process it is possible to complete the necessary transactions in around half an hour and there are hundreds of similar free bets and bookmaker bonuses available some of which can be found below. A variation on the new account bonus is the 'deposit bonus' which is calculated as a percentage of the amount deposited by yourself when opening a new account - typically 10 - 20%. A deposit of £500 could be topped up with a further £100 which is risk free money when we back and lay an event. Usually the bonus amount will need to be wagered anything from once to five times before it can be withdrawn. The process is slightly different from the previous example as you get to keep the free money once the conditions have been met. Say you open a new account with £100 and a 20% deposit bonus of £20 is added to this giving £120. 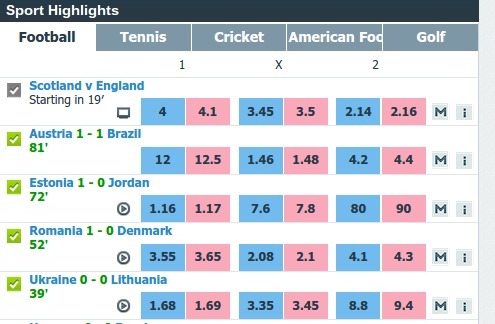 Now check through the events offered by the bookmaker and find one as close as possible to the lay price available with Betfair. A typical example may be a football match with Coventry to draw and bookmakers odds of 3.35 and Betfair lay odds of 3.50. If your £120 bet results in a draw your return is £120 x 3.35 = £402 ie a profit of £302 after deducting your £100 deposit. The £20 addition from the bookmaker has resulted in enhanced odds of 4.02 (£302 profit / £100 deposit) + 1 = 4.02. As before we use the Hedging Tool and enter the enhanced price of 4.02 in the back price window. The back stake is £100 and the Betfair lay price of 3.5 in the lay window. The default lay commission is 5%. Click on the recalculate button which reveals your profit on the bet will be £10.70 win or lose. NB you will need funds available in your Betfair account to cover the liability which in this case is £291.30. I first tried ZEturf and discovered after joining that they act more like the Tote and offer prices after the event based on the amount of money wagered on the event. In this case it was not possible to back and lay an event as I did not know the return until after the event. So I just backed a very likely odds on favourite which won so I was able to keep the bonus as well as a small profit. I found them easy to join and after betting the minimum 30 Euros I was able to withdraw the 30 Euros bonus after verifying my address. I did this by sending them by email a pdf copy of my driving licence.